I was just updating the ongoing Free Online Yoga Breathing Exercises E-book, with the recent Seetkari Yoga Pranayama article, when I realized I had not yet published the most fundamental and basic Yoga Breathing Technique – The Yogic Breath or Simple Yoga Breathing . The online pranayama (yoga breathing exercises) e-book has some excellent techniques of course, such as Kapalbhati Yoga Pranayama, Kundalini Yoga Breath of Fire, Alternate Nostril Yoga Breathing, but it does not have the Simple Yogic Breath, which is a must. So today I am going to detail this breathing technique, which is in and of itself capable of transforming your entire physical, mental and emotional state. Yogic Breathing is not really a technique, as really it should be the way you breathe all the time if possible. So learning and practicing this technique will help you regain your natural breathing pattern and along with it the many associated benefits. Below I explain this technique in detail and take you step by step in how to practice it. Please also read the Beginner’s Guide to Yoga Breathing Exercises to familiarize yourself with general guidelines on how to practice yoga pranayama. Improves lung capacity and helps treat all respiratory ailments such as asthma, etc. Improves the intake of Prana (life-force) to help the entire system rejuvenate and regenerate. Helps the body detoxify and increases oxygen supply to the blood stream. Helps the cardiovascular, nervous and immune systems. Helps the mind, body and senses come into rhythm and better coordinate function. Slows down the thinking process and calms the mind. Promotes a sense of peace and tranquility. Improves awareness and mental clarity. There are not many cautions for practicing Simple Yogic Breathing, just give yourself some time in developing the right rhythm and pace as it could take time to break old habits of shallow, rapid and wrong breathing. 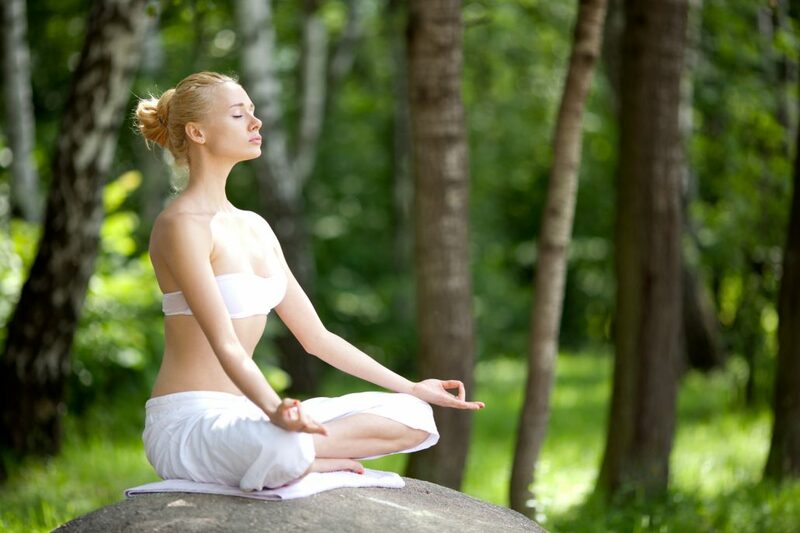 To practice Yogic Breathing sit up in a comfortable position, you can sit cross legged or on a chair if needed. It is also excellent to practice on your back in Corpse Pose (see Best Relaxation Yoga Technique – Corpse Pose). There are 2 distinct parts to Yogic Breathing and I will explain each of those below as well. If you are sitting, elongate your spine upwards place your hands on your knees and relax yourself. Next close your eyes and bring your attention to your breath. First you should begin with Diaphragmatic Breathing. Which means to breathe into the abdomen. Also called Abdominal Breathing. To do this, as you inhale allow your diaphragm to move down and stomach move out (expand). Try to only use your abdomen, not allowing the chest to rise (or fall) as best you can. On the exhalation, let the diaphragm move up and he stomach move in towards the spine. So only your stomach region is rising and falling on inhalation and exhalation. Continue on for 2 minutes, just using your stomach/diaphragm to breathe. Now try Thoracic Breathing, which is done by just using the Chest region. To do this, as you inhale only allow your chest to expand. At the end of the inhalation make a small effort so even the shoulder rise slightly to complete the inhalation. On the exhalation let the shoulders and then the chest deflate. Begin filling the chest from the bottom up on the inhalation and emptying it from the top down on the exhalation. Again, try not to let the abdomen rise and fall while doing this phase. Continue on for 2 minutes. Now combine both Abdominal Breathing and Thoracic Breathing and you will will have Yogic Breathing . To do this on inhalation let the air first fill your abdominal region and then move upwards into your chest region and finally filling out your upper chest with the slight rise of the shoulders. Then on the exhalation, let the chest empty and then your abdomen, finally pulling the stomach in towards the spine to fully expel all the air. Continue on for 5 to 10 minutes and see how wonderful you feel. There is another variation to Yogic Breathing, which is also very good and one I prefer, and that is the simultaneous expansion (rise) of the abdomen and chest on inhalation and simultaneous contraction (fall) of both regions on exhalation. So as you inhale let the diaphragm push down and stomach expand out, while at the same time let the chest and shoulder rise. Then allow them to fall and contract on the exhalation. There is no gap between exhalation and inhalation. As you practice, the goal is for the whole process to become smooth and effortless. Also, for the whole process to happen not in segments but as an integration whole. Like a gentle wave rising and falling. Going forward when I refer to Yogic Breathing I will refer to this description I have given above. I especially suggest you try the simultaneous rise and fall method I described above and I am sure you will find that most rewarding. Here are some nice tips to help you master this all important breathing technique. If you are having problems with Yogic Breathing, I suggest lying in front of a mirror and placing 2 heavy books on top of you. One on your abdomen and one on your chest. Then you should first practice Abdominal Breathing and just concentrate of having the book on the stomach rise and fall, after which you should just do Thoracic Breathing and have the book on the chest rise and fall. After that I suggest trying either of the 2 ways I have described Yogic Breathing. Having both stomach and chest rise and fall, or having them flow sequentially as I have described above. Yogic breathing is excellent to practice in Corpse Pose to achieve deep relaxation. If you are suffering from stress or anxiety I strongly suggest 11 minutes of this practice everyday. It has been known to significantly help with hypertension and high blood pressure. In time, a good rhythm to shoot for is 12 complete breath cycles per minutes, with inhalation being slightly longer than the exhalation for each cycle. Try to do Yogic Breathing without making a sound. This will help make the breath very fine and silky, which in turn will bring great calm and peace to the mind, body and emotions. Yogic Breathing can be done anytime and should certainly become a key part of your practice and life. It will also be incorporated into some of the new free yoga and meditation classes that we run here on the Mastery of Meditation and Yoga website. Glad you like the techniques. Thank you. Thank you for your positive feedback :-)) Glad you like it! Thanks for the great post. Thumbs up. The new look and design to the blog. Looks great. I like this one and especially that these are simple techniques which cannot hurt. Thanks! This is something which I was looking for ! Simple Yogic Breathing is a good way to relieve the piled up stress , I think most of your readers will benefit from it . I too run a yoga site called check it out .